fine de claire oester met rode wijn azijn en sjalotjes. A three-course dinner or à la carte dishes, they are all prepared with maximum care. Sustainability is a key ingredient here. You have a great choice of fish dishes, but also meat lovers and vegetarian don’t come for nothing. You don’t have to study the extensive wine list on your own, the friendly service advises you gladly. For children there is a special menu. Like you, they can choose between meat, fish or a vegetarian dish. Delicious seafood dinner! We had the oysters and scallops for appetizers and the chef’s duo for dinner. In addition, they brought us a smoked halibut mascarpone mousse appetizer..All expertly prepared. Our favorite dinner in Delft! I had a amazing experience, the waiter was very friendly and open. The food we had was really tasty and worth the price. That we could bring our dog and that the waiter was very welcoming towards us made the evening into a really good experience. I am definitely going to eat here again. We tried the Chef’s choice and it did not disappoint! His combination of flavors, food and wine was outstanding ???? and the service was first rate. Take the time to go here! Kwaliteit erg goed en attente bediening. The host was quite entertaining, informative, and quite knowledgeable about our dinner and subsequent wine pairings. The evening, just my date and I, and the staff of the restaurant, was filled with great food, laughter, and wonderful memories. I had a magnificently cooked sea bass with a Frucht d’Mer risotto, my date (not a seafood lover) had a ribeye steak and celeriac purée that was nothing less than spot on. Whilst there, HAVE THE CREME BRÛLÉE, you will not be disappointed. In fact your taste buds will thank you for some time! I’d highly recommend the Brasserie to anyone looking for great cuisine in a cozy atmosphere. I look forward to happy returns. Our sister date is always at this wonderful establishment. The wine is always exquisite and suits the courses wonderfully. There truly is nothing i could say negatively about this establishment. I love it. We always come back, as sisters or with our partners. I highly recommend it. Daan always treats us well and we always enjoy ourselves. The food is amazing. 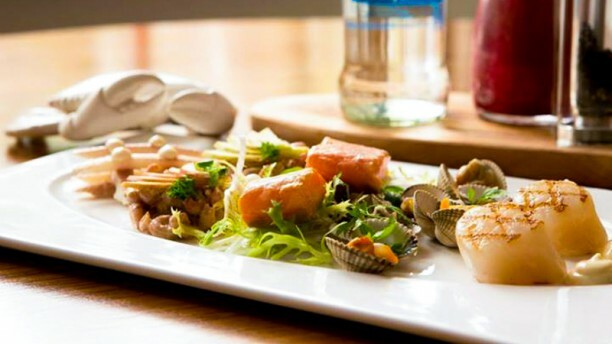 Its remarkable how an all seafood menu can remain so suprising and versatile. lovely restaurant and warm, polite service. We loved the food and the smile on the face of owner and helpers. Would most certainly go back to try every single dish on offer. Prima gerechten, subtiel en afwisselend. Fijne aandacht van bediening en kok. Aanrader. Fantastic restaurant, I would definitely go again with a warm welcome and a personal service. Lovely food. Book to ensure you get a table. Had an amazing meal with a group of eight. A total of three courses, accompanied with great wines. With great serving and the cook even came to explain his delicately prepared courses. I can really recommend this place. At the very least worth the train ride from Amsterdam for me. Will definitely return here. if we could give an 11 for service, we would have done it. Great small-scale restaurant with a unique atmosphere thanks to the only "server" the owner. We had for 4 persons the "surprise" menu and it all was very tasty. The wines selected by the owner to match the food, and damn is he good as matching that. If you like small scale, personal attention restaurant, we highly recommend this place. The food was beautifully presented and tasted as good as it looked, we had the fruit de mar, stunning.The service was excellent, you can tell all who work here are proud of their food , and maintain their high standards by not stretching their seating capacity. Wish I lived in Delft so I could visit this restaurant more.